Blend all ingredients in a food processor until they are smooth enough. I used canned mango pulp. Fresh mangoes can be used during season. Looks creamy! wish I had this rite now. WOW... This is my all time fav. Look so good. I also make it in the same way. YUM! Wow Delicious. My mouth is watering. Back home we used to make it almost everyday in summer and have it puris and chapathis. Yummm. Love mangoes. 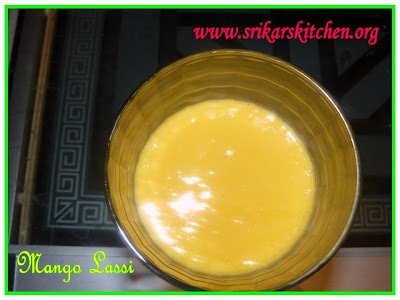 Double joy when teemed with lassi! Please collect your award from my blog. I must try that soon - looks delish. One of my favourite drinks :) Looks great. Are you trying to torture me with mango pictures. Love the lassi, it is cole here but still i would love to have them. I must try this soon. It sounds delicious. Fantastic site, I had not noticed www.srikarskitchen.org earlier during my searches!